In early April, I attended an area inspection with Tammy Schoo and Kyle Hewitt from PV, of Flat Rock and the Stapylton Ampitheatre to help ascertain whether it was possible to open up any of the climbing and bouldering areas in the vicinity in time for Easter. Also attending were Simon Mentz, Tori who runs a commercial guiding company and Rhys, a local boulderer. We were all really hoping that it would be possible to open up some of the climbing areas off Hollow Mountain for Easter visitation (such as Clicke, Guernica and the Kindergarten). We threw around lots of ideas, trying really hard to find options and reasons why it would be suitable to open up some of these areas but unfortunately try as we might, there were too many compelling reasons not to. 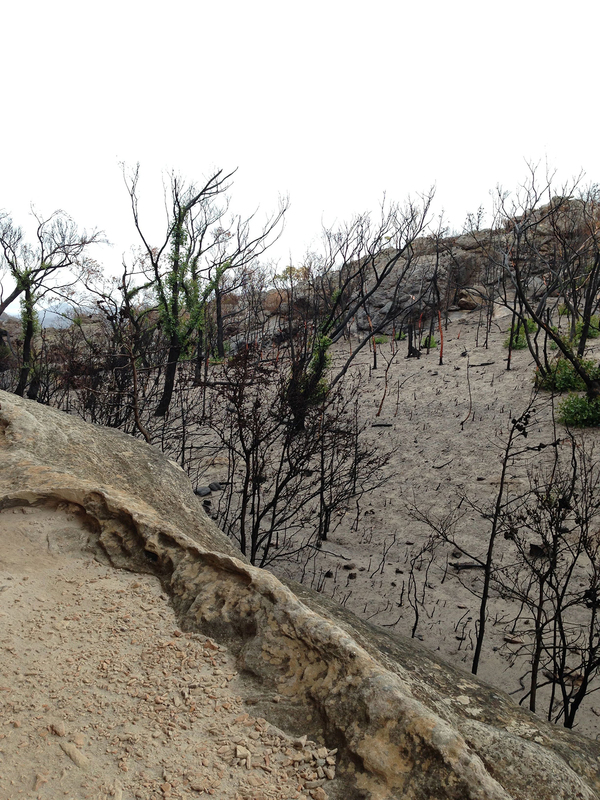 As you will see by the photos I have included, the area is badly burnt and still very sensitive. While the Kindergarten bouldering area proper is obviously on rock platforms (which is a definite plus for future opening) the area surrounding it is fragile and would not cope well with human traffic and most definitely not from toileting practices. Just this one aspect causes a mountain of troubles – there is literally no where to go without using the fragile areas. Our hopes that we could find a solution to this as well as encouraging people to not do the inevitable wandering off to another area close by (Andersons) by way of multiple temporary signs proved to be just that – hopeful but not realistic. So for the time being the closures in the area will stay in place. As I noted in a previous report, there is much discussion occurring around the North Grampians as not only a walking visiting area but focusing much more now on the climbing popularity of the area. Looking at the longer term management of encouraging visitors into the area and providing better facilities be it tracks, campgrounds and more suitable access to visitor sites. It is a much bigger picture rather than the very small, immediate fix up of a damaged area. This has been proven to not always be the best thing for an area. One of the positive things to occur from natural events to visitor areas is that due to the destruction and the need to repair and rehabilitate, it gives land managers a much cleaner slate to work with. To reassess. Much of the visitor infrastructure in place in parks, is there from a time past when requirements and visitation were much different. A good enough reason to not immediately rebuild as it was before. Granted, with the Grampians National Park they are still working with a very old Management Plan – which hinders rather than helps but that’s another story. …..
Another positive note to add to this is that the Grampians National Park has just been given $3 million dollars (part of a $13.5 million government funding investment in Victoria’s parks). This starts rolling out in July. I must say a really huge thanks to the team past and present at GNP. They take all of my (which are yours) thoughts on board and set up meetings and site visits to look at possible options when they have minimal time to spare and long, long lists of challenges to try and get through. In more recent times -3 major events in as many years! Whilst the following may not be major areas, there are a few sites off Flat Rock that we inspected, that have not been damaged and follow along rock platforms for the most. These are able to be used for climbing with the important note to not access any further beyond them. If this appears to be happening then this will threaten their use. 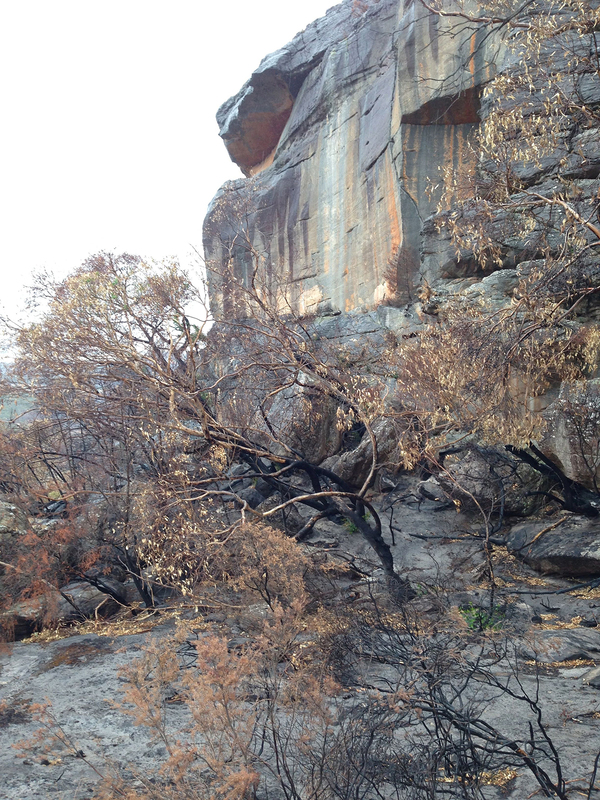 Please pass the information along if questioned – this does not mean the North Grampians is open for climbing though. These are exceptions to the rule. 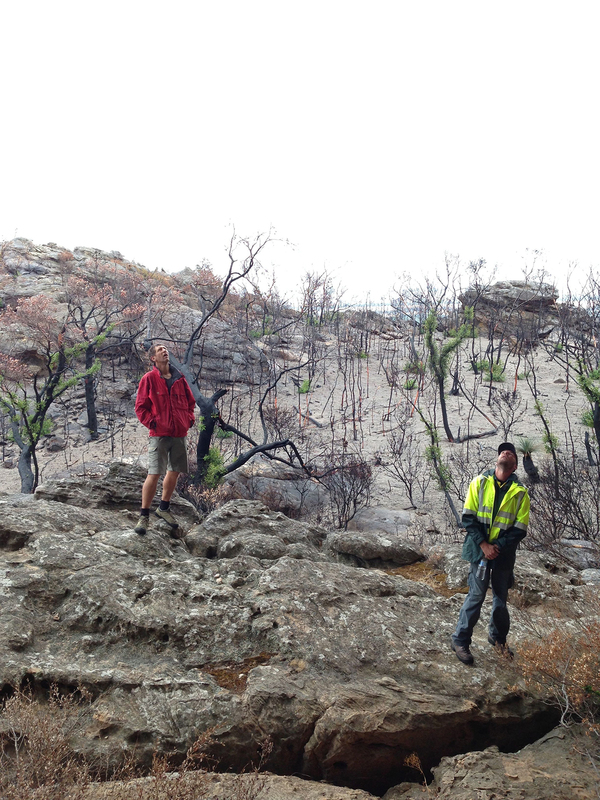 This entry was posted in Access &Environment officer reports, Grampians and tagged access report, Bushfires, closures, grampians, grampians road and track report, hollow mountain, Northern Grampians, parks victoria, reopenings by Tracey. Bookmark the permalink.